Hard living conditions for Syrian refugees in Libya are forcing some families to marry off their daughters to wealthy local men. Syrians say Libyans often knock at their doors asking for especially underage girls, as BBC Arabic's Ahmed Maher reports from Benghazi. 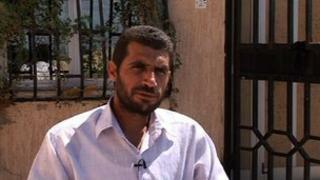 Ahmed Atrash is among hundreds of Syrian refugees in the country's second largest city, Benghazi. He and his family have fled the raging war back home. He says he would rather see Syrians beg in the street than married off to rich Libyans for money, lamenting that many were targeting underage Syrian girls. "We arrived in Benghazi two months ago and last month a Libyan man knocked at my door and asked whether I had a daughter or a sister to marry in return for money. I laughed and told him yes, I do have a two-year-old daughter," he told BBC Arabic TV. "He became angry, then I told him: 'Fear God! We sought refuge and protection in your country not to be humiliated'," recalls Mr Atrash, 38, who was a graphic designer in Damascus, but now works as a carpenter in Benghazi. The father-of-two is appalled that penniless Syrian families are being forced to sell off their daughters. "They are exploiting our financial distress. Many families here cannot provide even a square meal for their children." An official from the self-styled Syrian Revolutionary Union (SRU) said Libyan men often ask them to direct them to Syrian families, hoping to marry girls. One Libyan man told me: "Syrian girls are beautiful." Another pointed out that to marry a Libyan woman, her family would ask for a dowry of $19,000, while Syrians would only seek a few hundred dollars. There are neither refugee camps for Syrians nor an organised government scheme to host them, unlike in other Arab and Muslim countries, chiefly Turkey and Jordan. They are scattered across several Libyan cities and there are no official statistics on their numbers in the North African country. The SRU in Benghazi puts the number of Syrian refugees in the city at 1,000. Turkey hosts the largest number of Syrian refugees, with more than 80,000 at 14 separate camps. The United Nations said earlier this month that the number of Syrian refugees in neighbouring countries had reached a quarter of a million, with the unabated conflict accelerating the exodus. Some Muslim scholars believe the marriages are merely an expression of solidarity by wealthy Libyans, as Syrians are in dire need. "There is nothing wrong in such marriages if the men are financially able, whether they are single or married," said Sheikh Ashraf Al-Aqrabi, Imam of the Garyounis Mosque. "This is a religious duty as long as it is done by mutual consent. We must encourage Libyans to help protect such vulnerable families, because they might be forced into prostitution." But Mr Atrash doesn't agree. "This is modern-day slavery," he said angrily. "Using the word marriage is just a euphemism." Several Arabic newspapers reported recently that requests had appeared in online forums and chatrooms from men seeking marriage with Syrian girls in refugee camps for meagre prices. These requests, however, could not be verified. Mr Atrash and his family consider the marriages to be sexual exploitation. And it only adds to the trauma of leaving the homeland. "If they were really honest, they would come along with their mothers and fathers, not on their own. This is not a decent way to propose to respectable families in all Muslim societies." Mr Atrash chooses to speak up because he wants to protect the dignity of Syrian women who have sought safety abroad. "Syrian women escaped from rapes by [President] Bashar al-Assad's thugs to face rapes in the name of religion," he said.